Overview - Thomas Vinterberg directs this Danish thriller. 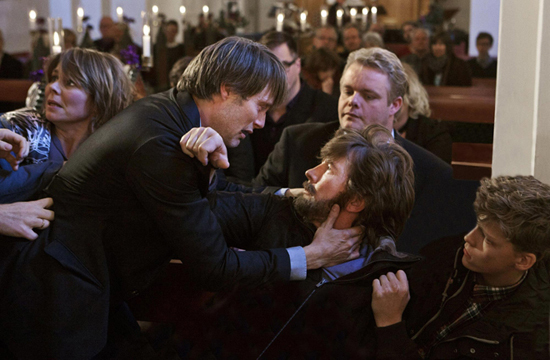 Mads Mikkelsen stars as Lukas, a recently-divorced primary school teacher locked in an acrimonious custody battle over his teenage son Marcus (Lasse Fogelstrøm). When five-year-old Klara (Annika Wedderkop), the daughter of Lukas's best friend Theo (Thomas Bo Larsen), tells the headmistress of the school - untruthfully - that Lukas has acted abusively towards her, the accusations quickly escalate and Lukas soon faces unanimous condemnation from everyone around him, including his closest friends. "… There is so much evil in this world, and if we hold on to each other, it will go away." Once something is said, it cannot be unsaid. Once an idea is planted, true or false, it is doomed to linger. Once an accusation is asserted, however unbelievable, a smidgen of doubt can fester and grow, until the realities of guilt and innocence no longer matter. The cold shadow of public perception can be more damning than any court of law, and even as all parties involved struggle to do the right thing, good men can end up punished. 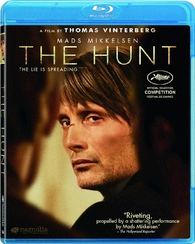 This is the gut-wrenching scenario that's presented to us in Thomas Vinterberg's utterly absorbing Danish drama, 'The Hunt,' and as our characters' lives are turned asunder, the film probes deep into the unsettling world of mob mentality, taking its audience on a frustrating yet undeniably powerful journey. Lucas (Mads Mikkelsen) is a recently divorced man trying to readjust to his new station in life. He works as an aid at a local kindergarten and spends most of his time playing with the children or hanging out with his hunting buddies. Lonely yet good spirited, he is well liked by his community, but after a misunderstanding, Lucas is soon accused of doing something he did not do. As the lie gradually gets out of hand, the town slowly turns on the innocent man, leading to fractured friendships, misplaced fear, and unfortunate consequences. Seamlessly calculated and meticulously paced, the film's narrative methodically positions all the necessary pieces into place, slowly setting up an unstoppable descent into tragedy. After economically and organically establishing Lucas' quiet but compassionate character, an innocent yet disturbing misunderstanding comes into focus, and soon it becomes clear that there is no going back. The manner in which the filmmakers so naturally escalate the drama is masterful, creating a palpably frustrating experience as we are forced to watch a lie blossom out of control. All the while, we, the audience, are certain of Lucas' innocence, making the false accusations and increasing vitriol that much harder to bear. It's like the character has entered a bad dream, and we constantly want him to wake up so that all the madness will stop -- but this is no mere nightmare, and Vinterberg refuses to take the easy way out, forcing us to confront a messy, uncomfortable world where good intentions are sullied and distorted into a devastating witch hunt. And though we know that the unsavory claims are all false, the film's examination of both sides remains intricately complex, creating a situation where it's often hard to truly fault those in the wrong for their behavior. They fully believe that what they are doing is right, engendering a morally ambiguous drama that constantly challenges our sympathies. 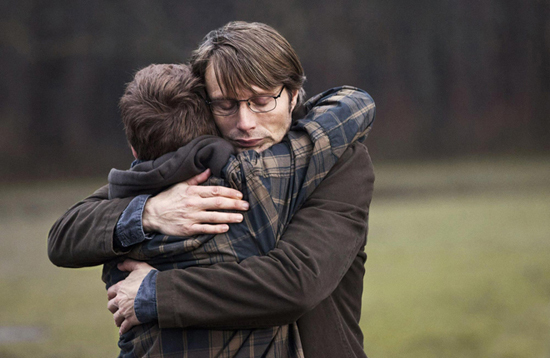 As star Mads Milkkelsen points out in the included special features, all of the characters' choices, whether right or wrong, are made out of love or fear, making their actions all too human. We bear witness as a good man is forced to suffer, but his tormentors' motivations are not evil. On the contrary, there are rooted in a desire for justice, layering all the heartache and loss in an uncomfortably murky shade of grey. Serving as the tragic punching bag for all the film's misplaced hate and anger, is actor Mads Mikkelsen. While primarily known in the US for playing villains (including the title character in NBC's 'Hannibal'), here the performer is cast against type, taking on the role of a lonely and kind man who just wants to live a peaceful life with his son and friends. Despite his sinister baggage, the actor effortlessly sheds any hint of his previously menacing performances. Instead, he immediately evokes a subtle warmth and a somber likeability. 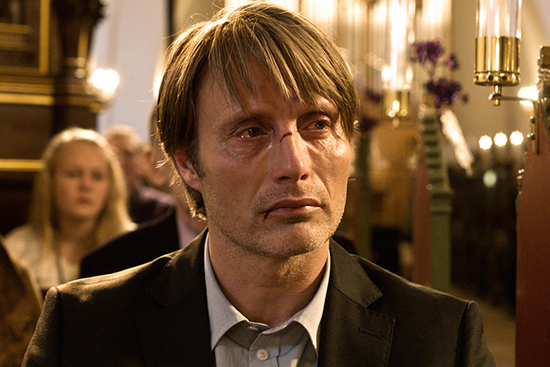 As the plot's heavy drama slowly spirals, Mikkelsen handles each new emotional turn with expert precision -- taking his character on a harrowing journey through shock, confusion, betrayal, rage, and defeat. The rest of the cast is equally strong, with a powerfully multifaceted turn from Thomas Bo Larsen who plays Lucas' best friend, Theo. His character is particularly torn by the story's false accusation, and watching him struggle to reconcile his newfound rage and lingering love toward his friend is heartbreaking. Also worthy of very special recognition, is child actress Annika Wedderkopp. Her character is central to the film's drama, and she turns in a startlingly natural and layered performance, always casting her unknowingly weighty actions under the innocence of childhood. An impeccably crafted drama and fascinating sociological study, 'The Hunt' is a truly powerful piece of filmmaking. With an understated style and deft hand, director Thomas Vinterberg offers a sensitive, insightful, and delicately tragic tale that exposes the weaknesses and strengths of love, fear, and human connection through the mournful decay of community and friendship. Neither overwhelmed with gloom, nor cheaply uplifting, the movie's conclusion finds just the right balance, leaving audiences with a satisfying yet still ambiguously open-ended finale that hints at more hardships to come. Deep and complex, the movie's themes and moral dilemmas have no easy solutions, challenging viewers to question their very concept of judgment -- though the verdict on the film itself couldn't be more clear. This is gripping, thought provoking cinema through and through, and thankfully, that's an idea that I have no qualms about planting. Magnolia Home Entertainment brings 'The Hunt' to Blu-ray on a single BD-50 disc housed in a keepcase. Some skippable trailers play upon start up before the disc transitions to a standard menu. The packaging indicates that the release is Region A compatible. The film is presented in a 1080p AVC/MPEG-4 transfer in the 2.35:1 aspect ratio. Nicely detailed and essentially immaculate, this is a very strong picture that is free from any notable issues. With the exception of some fleeting grain-like noise in a few shots, the digital source is completely devoid of any troublesome artifacts. The image carries a sharp sense of clarity with impressive fine textures and distinct detail readily visible in locations (one can make out every fallen leaf on the ground), clothing, and faces. Depth can be a little flat in certain shots, but outdoor scenes tend to offer pleasing dimension. Colors are natural and varied, offering cooler tones in specific sequences and a warmer glow in indoor scenes. Contrast is nicely balanced and black levels are deep with solid shadow delineation. 'The Hunt' makes its way to Blu-ray with an impressive video transfer. The modest imagery doesn't exactly wow, but the photography is artistically potent, detail is great, and there are no major technical issues. The movie is provided with a Danish DTS-HD MA 5.1 track. Optional English, English SDH and Spanish subtitles are also included. Appropriately quiet and subdued, this is a subtle but still relatively potent mix. Dialogue is clean, full-bodied and easy to hear throughout, whether whispered or screamed. A delicate air of ambiance is present when called for, particularly during outdoor scenes, spreading gentle nature sounds (birds, wind, rain etc.) around the soundstage. With that said, effects work as a whole is comparatively restrained but the track retains an appropriately modest sense of atmosphere. The score features nice separation as well, and dynamic range is wide and distortion free, bringing strong presence to both quiet and aggressive moments. The way gunshots loudly pop in contrast to the track's otherwise delicate tone, is especially striking. Balance between all of the audio elements is handled well with no technical issues to speak of. While the mix isn't always as enveloping as it could be, the minimal design work is remarkably effective, and the sparse soundscape works well with the somber subject matter. Magnolia has provided a small but worthwhile collection of supplements, including deleted scenes and a making of featurette. All of the special features are presented in 1080p with DTS-HD MA 2.0 sound and English subtitles for the foreign language portions. Alternate Ending (HD, 1 min) - A much more depressing alternate ending is included. The filmmakers definitely made the right decision by choosing the more ambiguous and open-ended conclusion used in the final cut. Outtakes/Deleted/Extended Scenes (HD, 12 min) - A collection of four excised scenes is featured here. We get a bit more with Grethe, a lot more with Theo's internal struggle over his dissolving friendship, and a few cut bits that establish Marcus and Lucas' relationship much earlier on. This is all very strong material, but the scenes would have likely hurt the film's pacing too much if they were included. Making of The Hunt (HD, 7 min) - This is a featurette about the film's production with clips and cast & crew interviews. The participants discus the story's inspirations, their approach to the material, and the movie's casting. Though short, there are some worthwhile insights offered. Trailer (HD, 2 min) - The film's trailer is presented in 1080p with DTS-HD MA 5.1 audio. 'The Hunt' is a delicately crafted and utterly absorbing drama that challenges audiences with weighty moral dilemmas and harrowing tragedy. Fueled by precise direction, incredible performances, and a fascinating sociological study, the film leaves a lasting impression. The video transfer is impressive with sharp detail and no technical issues, and though a bit restrained, the audio mix is subtly immersive. While the disc isn't packed with special features, the included deleted scenes and featurette offer very worthwhile material. Emotionally affecting and artistically composed, this is a truly gripping piece of cinema. Highly recommended.